Include or exclude derivative action in your PID settings? A TEMPERATURE CONTROL system is very slow. Would you be inclined to include or exclude derivative action, in your PID settings? I only work on Gas Turbine Power plants and DCS projects. I have never used derivative gain. There is too much fear in the transmitter noise that could affect the derivative. You can get the proper tuning needed with just P and I. Derivative has no use in slow processes. It is only really useful in fast loops. I believe people in the drives industry use it. Derivative is commonly used in slow loops like many temperature loops. Derivative action is essentially an extra kick in the action of the loop to get the loop moving faster when there is a deviation between the setpoint and the measured variable. Like most things, there is no such thing as a free lunch. While the loop may move faster, poor tuning can result in overshoot and even loop instability. In addition, derivative action amplifies loop noise. Whether you use it or not, or how much depends on what loop performance you are trying to achieve. Here are some websites that may help. To add a note of caution to Bill's recommendations, in many practical cases the derivative action of a PID controller acts only on the signal measurement, not on the error. To make this explicit, it can be written as PI-D, but that is not always done. So if you rely on the 'kick' aspect of derivative action, you need to be sure the derivative acts on the signal error. When derivative acts on the measurement only (or at any moment when the setpoint doesn't change), it has the effect of acting like a brake, stabilising or 'slowing down' the system. It reduces the oscillations that can be caused by the introduction of integral action in the controller. 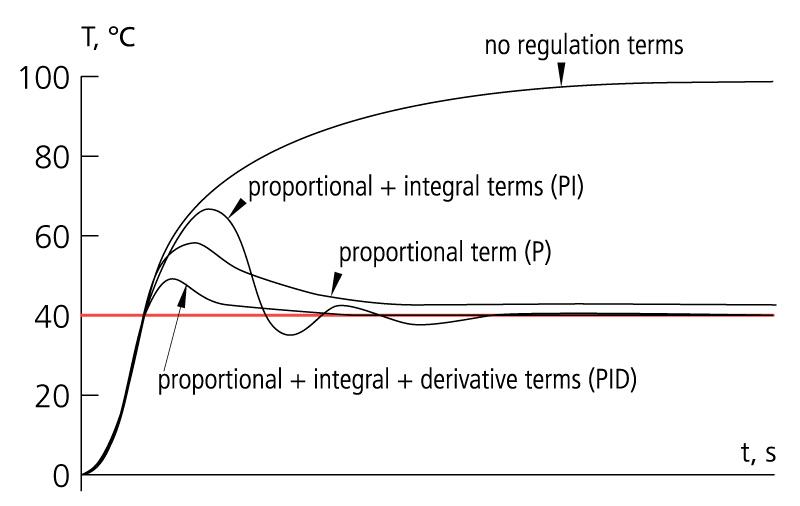 This is the motivation behind the derivative aspect of most PID tuning algorithms, manual and automatic. However, as Bill noted it is sensitive to loop noise. This is true only if the P and/or I gain is raised appropriately along with the introduction of D gain. Just adding D gain all by itself without making any changes to P or I will only make the loop more stable - i.e. less likely to overshoot. D gain acts in such a way that it opposes change in the measured variable - any change - even change in the direction of the setpoint. So adding D gain to a loop that is already stable will only slow down the acquisition time. As others have mentioned, D gain is unreliable if the derivative has too much noise. That depends on the update rate of the measured variable and the inherent noise in the measured variable. But if the derivative is reliable, then adding D gain might allow you to increase P gain beyond the level where you would get instability without derivative feedback. Temperature control can be "slow" because of the process's ability to pump heat energy into the system is limited. Limited steam flow, limited burner size, limited heating element size, whatever. Changing the tuning will not "speed up" slow temperature control which due to insufficient heat capacity. If the system can supply sufficient heat to create a faster response, then re-tuning with a higher gain/lower PB would be my first effort. Derivative works fine in command and control servo systems, but with temperature controls, like previous responses suggest, are usually characterized by long lag-time or delays and unstable with derivative action. There are costly advanced control strategies that are heavily instrumented but rarely encountered. I agree with David regarding the slowness of a temperature control loops can be due to the controlled variable (e.g. steam, hot oil, furnace, etc.) having limited ability to supply heat to a process with a large thermal time constant. That is not to say that you can not speed things up though. Derivative primary purpose though is to flattening the error trajectory by reducing the error rate of change to zero. Reducing the proportional band (e.g. increasing the gain) can improve temperature control in some cases but increasing the gain can also lead to overshooting and instabilities in slow loops. The "P" in PID for proportional control (the math) was developed for automatic steering systems for ships in the early 1920's though it was used through history in various forms. The "I" in PID was developed by Foxboro in the 1930's and was called "Reset." Reset was designed to reduce the proportional control offset error. Reset units were repeats per minute or minutes per repeat, where a repeat was equal to a 100% change of controller output per unit time. Actually, my goal is to have a sandwich named after me.